There is nothing more than the stories being told about Abo Ali Khabiyeh. Starting from the continuous announcements of his murder which turned out to be rumors and nothing more, the debate of others about what they called recklessness & strategic mistakes and ending with stories of his courage & nobility. There’s no means to unravel the truth from the myth and facts from rumors in most of those stories about the man and his fighting battalions. In the streets of Douma, there are contradicting opinions and stories differ from extremely negative to the other extreme of positivity. We are not in a place to evaluate the Douma Shield Battalions or their lead, we only hoped to converse with Abo Ali Khabiyeh about some of the points which have never been tackled in spite of his continuous appearances in the media. We started with regular conversation on ammunition resources and the relationship with the Military Council in addition to the the coordination among battalions. Even though the Douma Martyrs Brigade to which the Douma Shield Battalions belong is a member in the Military Council but Abo Ali says that his personal stance is that he doesn’t recognize the Legalism System, the Parliament Or any thing else. As a field commander, he said, when he goes to the Military Council asking for ammunition and and they cannot give him even a few. So, on which basis would those councils have an authority over the battalions and why do we have to recognize them and be loyal to them?! He said: The support for the Douma Shield Battalions comes from individual and limited resources, and they do not pay for their fighters as the other brigades and battalions do. Maybe it is not only the issue of ammunition that defines the relationship of the civil fighters with the recruits. To be frank, it isn’t only the immunization issue that defines the relationship between civil fighters and dissent recruits. It is being said in the streets that fighters do not like the dissent recruits and they work on their “alienation”! On the other hand, the dissent recruits patronize the field commanders who do not have military background. This is what is being said and it might be just “tabloids talk”. But we cannot stop thinking about it amid the the lack of dissentions among the high military ranks which is obvious in several battalions and brigades in the area then comes the issue of weak planning and coordination of military operations in the same area. The issue of dissent recruits rise again when it comes to ammunition of which there was an issued decree to send it to the fighters in Syria. It is being said – and we did not confirm the news from direct sources- that these weapons will be given to battalions led by dissent officers. Abo Ali said they have heard about the arrival of ammunition to one of the fighting battalions in Eastern Ghouta which is being led by a dissent officer but his battalion did not receive anything till that moment. Also, he confirmed that even brigades among which there is no dissent recruits were receiving ammunition and weapons from their own sources; though these brigades are loyal to foreign parties and have un-national projects. Speaking of the incidents that lacked planning and military strategies which are the basics for all battles, we have conversed about the incident of entering the Midan neighborhood in Damascus which had brought severe criticism to Abo Ali Khabiyeh since it was strategically wrong and a reckless decision of him. Abo Ali said he had met with 80 commanders from Eastern and Western Ghouta and had agreed with a colonel in Western Ghouta that once he entered to Damascus, he was supposed to get backed up from several formations of the Free Syrian Army after 6 hours. They believed in themselves and entered the Midan neighborhood and a group were waiting for them there. He was designated as a leader for that battle and they stayed 6 days and nights without sleeping. The 6 hours have prolonged to 6 days through which they were fighting non-stop even for 6 minutes! The back up did not come. They have destroyed a lot and killed many of the regime’s forces eventually, they had to pull out not because insufficient ammunition but because the backup did not show up. 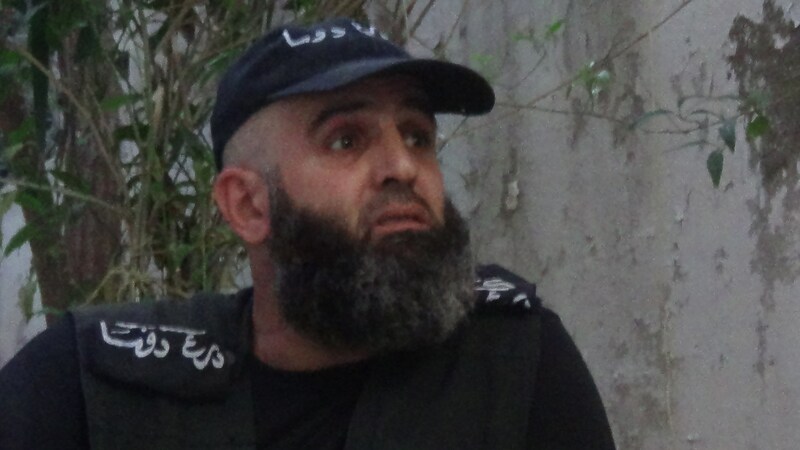 Before they have pulled out, he called Abo Sobhi Taha (commander of the Douma Fighters Council and deputy of the Revolution’s Military Council in Ghouta) and he told him that it was the last time he will ever talk to him again. He was awaiting death and looking at tanks’ gun barrels directed to him surrounded by martyrs, wounded and exhausted fighters. He cried while retreating, when he saw hundreds of fighters pulling out with them although in the main fight only 100 have participated. He wondered from where all of these people have come, how and why they did not participate in the battle. He knew that the people of Midan neighborhood who opened their homes and host them are saying that Abo Ali brought regime’s strikes to Midan, destroyed it and then retreated but he claims that he didn’t enter by his own and sole decision. There was a previous mutual agreement with many formations of FSA. “Entering Midan was a big mistake but it was also a powerful strike to the regime.”, he said. At any rate, “Abo Ali” thinks that the main problem which has caused all the negative impacts on the revolution throughout time was the fact that in the beginning of the revolution they used to go for operations to attack a checkpoint, pray and go, they used to accomplish victory, come back, pray to thank Allah and they were happy. Now, every thing has changed. Fighters are running after booties, they have legalized robbery under the name of the revolution, and of course drugs. I asked him if we want to file a complaint against ant of the members of the commanders of “Douma Shield Battalion” what is the solution? We have asked Abo Ali about their relationship withe the civilians in the city, particularly about their battalion and several others performing services which are supposed to be provided by the civil functions not the recruits. We have asked Abo Ali about his statement of Bashar Assad’s death which has hit more that 2 millions view on YouTube within a few hours, then it was discredited, and we have not heard any explanation from him about what has exactly happened though many Syrians felt bad and that they were deceived by it. Surprisingly, Abo Ali still insists that Assad was murdered and that his continuos appearances on the media are fabrications by the Syrian regime. We asked: What is the truth of “Abo Ali Khabiyeh”, stories ranged from being extremely tough and a merciless person to someone with a great deal of courage and nobility? Syrian human rights activist lawyer, participated in Syrian revolution in 2011 and was one of the founders of the Local Coordination Committees, which has been active in organizing peaceful movement in Syrian revolution. Razan holds several international awards in human rights and freedom of expression. Razan continued her humanitarian work in east Ghoutta in countryside of Damascus, but she was kidnapped with three other colleagues (Samira AlKhaleel, Nazim Hammadi, and Wael Hammadeh) by extremist group that controls the area, in December 2013. Razan is one of the founders of “Talaana Aaharih” Rising For Freedom magazine, and she kept working as a key editor until she was kidnapped.